The Violin Shop: Round or Octagonal Bows? Design question- Octagonal bow stick or Round bow stick - We get asked this question a lot! The answer is really whichever bow sounds best with your violin (or viola, or cello), and whichever bow feels best to you (hopefully they are one and the same!). 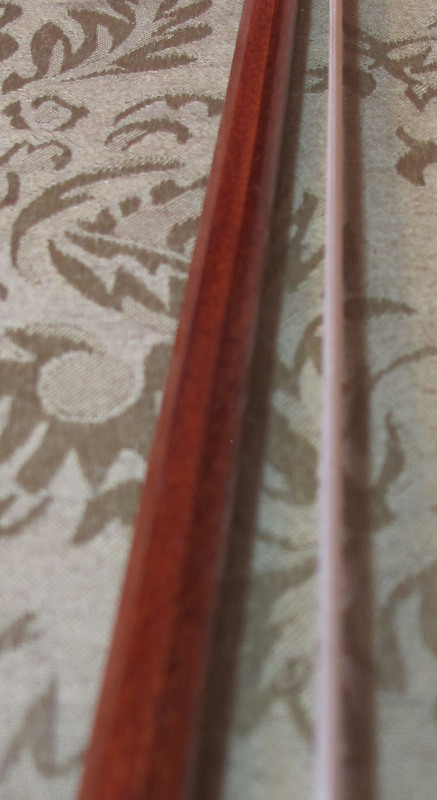 A good violin bow is made from a type of wood called Pernambuco. The wood itself can vary greatly in the feel and the sound that is created. Most of this comes from the fact that different pieces of wood will have different qualities. There are also different variables that are present when comparing bows, so it is almost impossible to discern whether a quality difference between them is due to the different shape or something else entirely. Each bow, for instance, has a slightly different balance point. This can make a bow more or less comfortable for an individual player. Also, the weight of the bow and/or the weight of the frog can make a difference as well. While we are at it, a quick note about bow weight. There are a lot of opinions out there that a bow of a certain weight is needed. This may be true in some cases. However, it is extremely difficult, if not impossible, to tell which bow is heavier when comparing them. I myself have sworn that one of my bows is heavier than the other, only to find out, upon weighing them carefully, that exactly the opposite is true! It turns out that what I was really feeling was a difference in the placement of the balance point, and not a difference in weight at all! In fact, when it comes to a good bow, the quality of the wood and the placement of the balance point are the most important features. Sometimes this might be a bow with an octagonal stick, and sometimes this might be a bow with a round stick. Only by trying many different bows will you find the perfect one for you and your instrument! Interested in purchasing a bow? Check out our Fine Carbon Graphite, Hybrid, and Pernambuco Bows! The underlying question I was really asking is all other things being equal, does the octagonal shape give more structural stability? For a given piece of wood, is there anything that would motifate you to create one shape or the other? Is one style easier to make? No, the octagonal shape does not give any more structural stability. But I'm sure there are 50% of bow makers and string players that will disagree. If anything, I would think that the round shape would be somewhat stronger. Imagine a Roman arch versus a pointed roof. Octagonal bows are a little harder to make precisely. That is why many exhibition and contest bows are round. Far more important than any of this would be- how does the bow feel in your hand and interact with your instrument? Andres Segovia said "...my greatest satisfaction comes from giving the guitar its rightful place in the musical gallery by transcribing musical works originally conceived for the lute, harpsichord, and solo violin (especially with the rounded bow." Is the comment and text above the rounded bow to which Segovia refers?